The process of storyboarding is continuing! I have moved onto the second scene and am close to finishing it up. This past weekend my wife and I took our last weekend trip and headed to Minneapolis for a concert and some hiking. 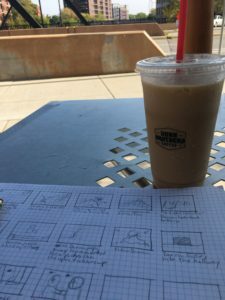 We made some time Saturday morning to sit and enjoy some coffee and work on projects, in my case, I continued to work on storyboards. I promise I’ll break these down more soon, which leads to the next item up for the week. 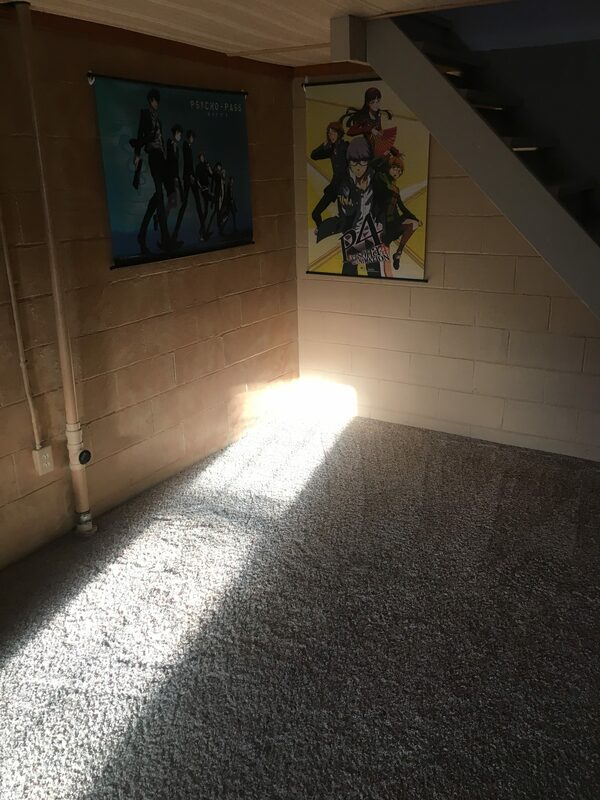 Last week I had to take apart the studio to get the carpets cleaned so my desk and everything got moved out of the space. My plan is to get everything put back in place in the next night or two so I can get my mic and everything set up for recording. I do have some videos I need to get recorded and uploaded, I promise those will be uploaded real soon 😀 I really appreciate your patience! My plans for the upcoming videos include an updated Patreon video for episode 2 and also more of an in depth look at the script for episode 2. Let’s get to work! Hey everyone! I got back safely from Dallas and AnimeFest. I had a fantastic time and I just wanted to say a quick note that I was home and that I will be back for a production update next week to recap the event. Stay tuned! This week I spent some time refreshing a couple of my panels before I head to AnimeFest at the end of the week. This week I am going to be spending some time expanding on my animation panel. This panel is still in it’s early phases, I performed a strip down version last year at Nebraskon and it did really well, the room was packed. So I want to polish up a few areas and also expand some areas that other attendees had questions on. My goal with the panel is to help people understand more about animation but to also help give some resources to people who are interested in animation and to help demystify it. Last week I also met up with another local content creator to just pick his brain a bit. The reason for this, is I want to update and relaunch my Patreon page in next couple months, with more focus on content creation and what all goes into animation production. I have another meet up planned for this week. Speaking of meet ups, I am also relaunching the local animation meet ups. I used to organize these a couple years ago but things tapered off a bit and our venue also went through some remodeling. However, I have met some more animator’s and wanted to bring them together in a place where we can learn and talk shop together. I will be sure to bring the content I make to the site and more. I am looking forward to these meet ups and can’t wait to see what everyone is working on! Hey everyone, catching up on a few things after the busy rush. I have some wedding planning and design to do for my wedding this summer, which now less than a 100 days away, it’s getting real 🙂 There was also some really unseasonably warm weather this past weekend so I took the opportunity to get a lot of hiking in since a new winter storm is due for the upcoming weekend. This past week I changed gears a little and started focusing on the type of content I want to be creating in for episode 2. I have a little more work to do on this front and I also am starting to plan my convention schedule. I have a lot of family events in the first part of the summer so I am planning on putting conventions on hold for the first part of the summer and focusing more on the fall and finding a new convention to attend as well. More on this to come! This week I started working on some animation tests for Cosmic Rage. The first issue I wanted to tackle was mouth movements for the characters. The workflow adjustments I am making here, involves using a tool called lipsyncr. This tool allows for After Effects to analyze the voice over file and make adjustments to cue up certain frames for mouth shapes called phononyms. That way, I can get around using just lip flaps and also drawing each frame individually. This tool allows for you to use various levels of detail in this regard. In this test, I used only 4 mouth shapes, testing out the low end of the spectrum. The high level of detail allows for 12 mouth shapes. My next test is going to involve the in between setting that uses 7 mouth shapes. Keeping up with the theme of “New”. I ordered my first new tablet since my very first one I ordered in college. For the second episode, I want to do more frame by frame drawing and a traditional tablet, just wasn’t working the way I want it to. Some lines were jittery, and it may take several strokes to get a line the way that you want it to. I felt that in order to really make this an effective workflow, I needed to upgrade my tablet situation. 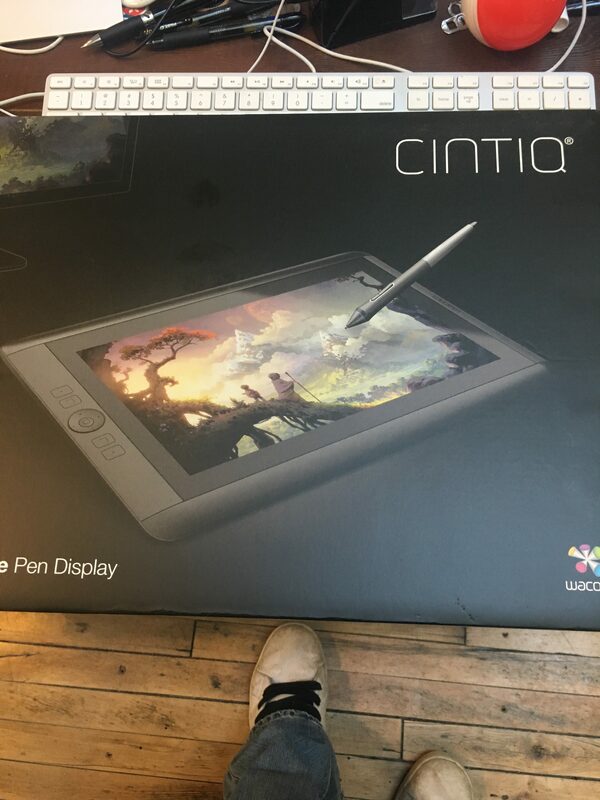 So say hello to my new Wacom Cintiq. I spent the later half of the week exploring the tablet a bit and working on setting up some various settings for hot keys to really make working with it efficient. I am planning on using the Cintiq for my next animation test using lip syncr. I will break down these various forms in depth upon completion. This week I am starting a new session of teaching assisting online as well to kick of 2017. So when I am not at work or critiquing work, I will be working on the new animation tests. I am so ready for 2017! Over the holiday break, I took some time to catch up on some manga that I have been meaning to get to. The first item up for reading, volume one of Inuyashiki. This series became my priority for reading, since I read that it is supposedly getting an anime series. It is done by Hiroya Oku, the creator of Gantz. Gantz is one of my favorite anime series, due to the social commentary it contained, but admittedly I have not read all of the manga. One of my favorite things about that franchise is the difference between the manga and anime. I wanted to flip the script on this series and tackle the manga first and also before I fall too far behind, so let’s dive in and see what this series is all about. I wanted to see if it packed the same social punch as Gantz. 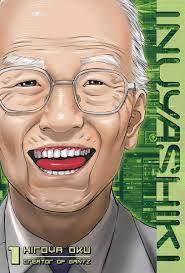 The story centers around Ichiro Inuyashiki, a 58-year-old man who is very shy, timid and lacks confidence in himself. We get glimpses of his life, how his interactions with his family and how he fits into society. Needless to say, it’s very uninspiring and you can see that Inuyashiki’s strategy is to basically get by in life, remain hidden from trouble and not to cause any form of confrontation, whether with family or strangers. But his personality and place in society is not the only thing going wrong with Inuyashiki. We also find out early on that he has cancer and doesn’t have long to live. This life changing diagnosis, inspires him to purchase a dog and they quickly become best friends. A friend that Inuyashiki feels like he can talk to, quickly developing a relationship more in depth than that even with his own family. However, one night, Inuyashiki takes his dog for a walk and has a terrible, unexplained, accident. Throughout the next few days, Inuyashiki struggles with himself, not feeling like he is the same person he was prior to the accident but also still confronting the fact that he is nearing death. If you don’t want the first volume to be spoiled, I would suggest not reading much farther. Inuyashiki, feeling ill, visits doctors and more to get clarification on his diagnosis. These medical tests all come back with errors and the doctors are baffled with the situation. It is revealed that Inuyashiki has now become a robot. With his newfound robot capabilities, Inuyashiki starts to change and decides that he can explore his new capabilities. While out, Inuyashiki comes across a homeless man that is being assaulted by a younger crowd of kids. This is a topic that makes it’s way into Gantz, so I am eager to see how this develops in future volumes. Inuyashiki is able to help stop the attack and even uses some social media components of his new powers to share the attack and information with other people through sites like Youtube and more. I felt that the first volume of Inuyashiki was pretty intriguing. I don’t know of other series that have an older super hero. There are also many different social angles I am interested in as well, the role of the homeless (given the fact that it was involved in Gantz as well), how Inuyashiki will handle and adapt with his powers, but most importantly, this concept of public shaming the attackers through social media. I will have a review of more volumes of Inuyashiki as I get them read, I think there are currently 4 or 5 volumes out so far. Last week, I took one night to go and check out an indie movie at a local club. I saw the trailer to Tower and immediately knew I had to go. If you haven’t seen it, check it out above. The reason I wanted to see the movie, was really two-fold. The topic itself, a school shooting from the 1960s. Being a millennial, I honestly thought the first school shooting was Columbine and never would have guessed that it happened prior to that, let alone in the 1960’s. The other reason, the art style. I have been crazy about rotoscoped work for the last few years now, ever since Flowers of Evil came out. Tower blends rotoscoped footage with original footage from news broadcasts and other clips from the actual event and interviews. Based on the credits, I believe they hired actors and actresses to play out the more cinematic and rotoscoped scenes that help paint the story of the eye witnesses. I thought this was an interesting approach, obviously that footage didn’t exist so using the rotoscoped footage to create these sequences really help put the viewer into the scene and help paint the actual situation and build that suspense. The film tells the stories of a handful of people impacted by the shooting, from a pregnant student, a kid delivering newspapers, a teacher and more. Seeing their stories starting to cross and eventually seeing how their story played out to this day, was simply amazing to hear and see. Again, as a millennial, school shootings in our lifetime have revolved around high-powered weapons and typically the gunmen end their own life. Seeing the events of other acts of terrorism and how the police have started using robots and drones, the film also talks about logistical problems of the 1960’s that we simply don’t think about. As you can see from the trailer, the shooter is a sniper in a tower. The movie at one points says that they tried to shoot the sniper from a plane, a method you simply wouldn’t see today. One thing that really struck a nerve with me in the movie Tower, is hearing the survivors stories about gun violence and how this has been something that has impacted people and educational institutions for 50 years now. Ever since Sandy Hook, I have questioned what it would actually take for elected officials to do anything try and reduce the amount of school shootings. Unfortunately, 20+ kindergarteners were not enough to get any traction. I really can not emphasize how much I enjoyed Tower, I was in suspense the entire time and it was a pretty intense film that was well crafted from the various people’s stories and also from the blending of rotoscoped footage and archival footage. If you get the chance to see Tower, go. Share it with everyone you know. No production update this week since episode 1 is now online. Enjoy! Production Update 188: Where is my E-book? I got my revisions made to my e-book and have them submitted to my editor for one final pass before publishing. This should be good to go into the store soon. Most of the edits have been making sure pages didn’t have a pixel bleed that was distracting and I also need to tweak a few pieces of art, which will be things I tackle tonight. Mostly subbing in new renders for ones I didn’t get to before as I was working on the episode and shelved the e-book for a bit. Things will calm down this week a little bit more. I finished up one of my freelance projects and things are moving pretty well on the packing front. That will wrap up before I head on vacation to unplug for a bit. More stuff coming soon! Help keep production of Cosmic Rage running, support the project today! Subscribe to the Cosmic Rage Monthly Newsletter! Get monthly updates, breaking news and exclusive behind-the-scenes content delivered right to your inbox. Production Update 225: Where has Summer Gone?